Maybe it’s just me, but I’ve always thought the Waverider would be a pretty sweet place for a dance party. (It’s not just me, is it? I mean, if Gideon can heal the injured and chart courses through time, surely she’d have no trouble laying down some serious grooves.) Perhaps we’ll see that in this season’s third episode, which is entitled “Dancing Queen” and airs Monday, November 5. Set in the 1970s, “Dancing Queen” finds the Legends attempting to foil a plot to bring down the British monarchy. 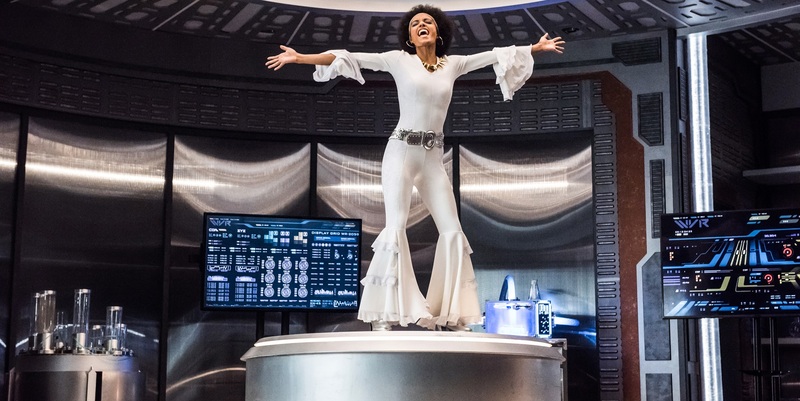 But let’s be real, the episode is REALLY all about Sara Lance and Zari Tomaz dressed in vintage punk and the returning Vixen’s magnificent flared bodysuit and afro. (Also, notice I didn’t refer to her as Amaya. *wink wink*) What are the chances we’ll see her and Mick dancing to “Disco Inferno”? DC’s Legends of Tomorrow airs Mondays at 9 p.m. (8 p.m. CST) on The CW.